Today is polling day for the long-awaited Scottish independence referendum and Fife News Online are coming out in favour of a Yes vote. The reasons for this are many and varied but at their heart they boil down to the very simple idea that nobody will govern a country better than the people who live there. It stands to reason that the people who live here and are affected by decisions should be the ones to take them, rather than people who will never feel the impact of them, in a remote UK Parliament. Not just remote in terms of distance but in terms of lifestyle, where to be a Cabinet Minister is to be a millionaire, usually before taking office. Despite the best efforts of the Daily Record to convince people that “Devo Max” is on the table after a No vote, it simply isn’t. Immediately it was announced by Cameron, Clegg and Miliband, disgruntled backbench MPs from their parties started to make their voices heard, vowing to vote it down. There is no appetite in the rest of the UK to give Scotland more powers in the event of a No vote. The other point to stress is that Westminster could have put in place these powers for the Scottish Parliament but hasn’t. There is little reason to believe that with the threat of independence off the table for a political generation that this would ever come to fruition. We feel a bit like the little boy pointing out that the Emperor is naked but Britain is broken. There are rising numbers of food banks as people struggle to feed themselves and their families. We have a benefits system which is not fit for purpose which sees people who are seriously unwell being forced to take assessments to determine their suitability for work. Parts of Scotland have a lower life expectancy at birth than war-torn parts of the world like Iraq. The Scottish Council for Voluntary Organisations estimates that 870,000 people in Scotland are living in poverty, with almost half of all children in the East End of Glasgow growing up in poverty. This is clearly not a system that is working for us and closing our eyes to it wont help. We have waited for Westminster to make inroads into poverty and despite there having been a recent Labour Government there, little improvement happened. We can’t wait any longer just hoping that things will somehow get better. Doing the same thing again and again and hoping for a different result is futile. The “Better Together” campaign has tried time and again to scare people into voting No. There have been all manner of wild claims from food prices going up (subsequently denied by the supermarkets in question) to Scotland being at risk from attacks from space. Yes, this was actually uttered by a UK Defence Secrteary. This contrasts with the message of hope and positivity emanating from the Yes campaign. They have energised the political landscape in Scotland and have excited and engaged people who felt alienated with politics until very recently. There are now 97% of the entire potential Scottish electorate registered to vote and it is hard to see these new voters moving in great numbers to support the very system that alienated them in the first place. There is a feeling of hope in Scotland for a new politics that transcends the bitter party-political rivalries of old and this is something we would love to see flourish and take root. Let a thousand flowers bloom in our fertile soil of debate but debate without power is only conversation, debate with power is real change. This is the biggest question you will ever be asked. For the duration of polling day today the power is in your hands. It is your decision whether to keep it in Scotland or hand it back to a remote Westminster Government. 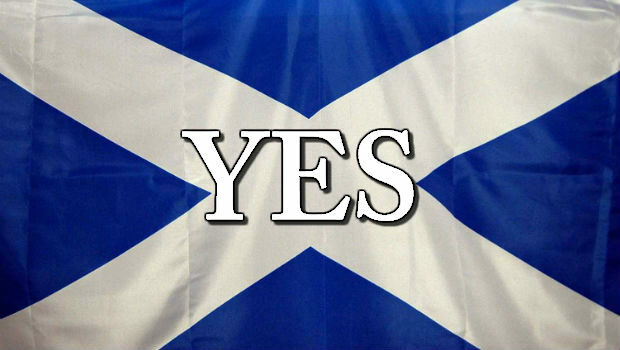 We would ask that you consider voting Yes, with both your head and your heart in unison.